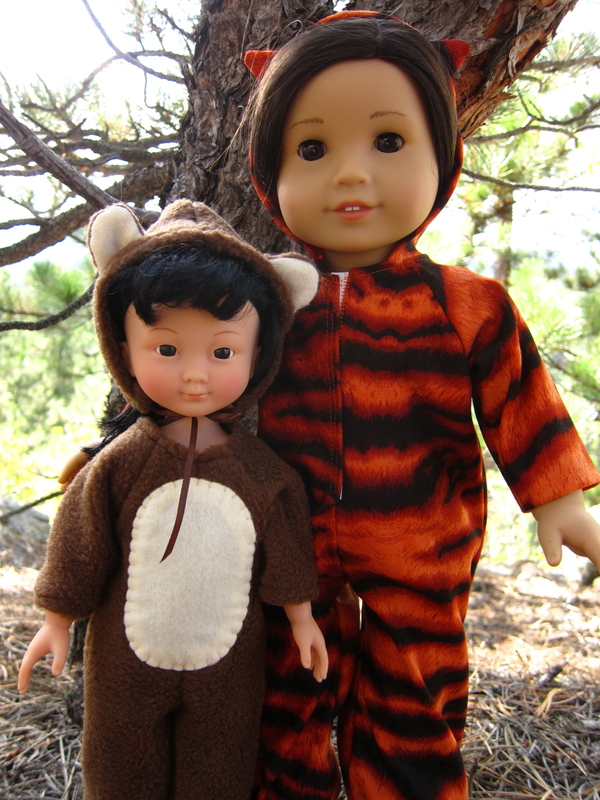 New patterns and tigers and bears…oh my! Ever wonder happens when you buy one of my patterns? (Well, obviously, you print it out and go sew) Me? I do a little happy dance, and then I add that total to a list I keep on my fridge. That’s my budget for buying new dolls, fabrics, trims etc. Buying new fabric and dolls inspires me to create new patterns for you, but you are also encouraging me to produce more free patterns. I try to give back to the doll community and keep a good ratio of free patterns to more complex ones that end up being for sale. If you’re thinking, oh… that’s nice… another free pattern, I will share with you some of the emails that I have gotten. There are moms and grandmas out there who literally have to save up to buy the little girl in their life a Hearts for Hearts Girl or Target’s version of AGs. 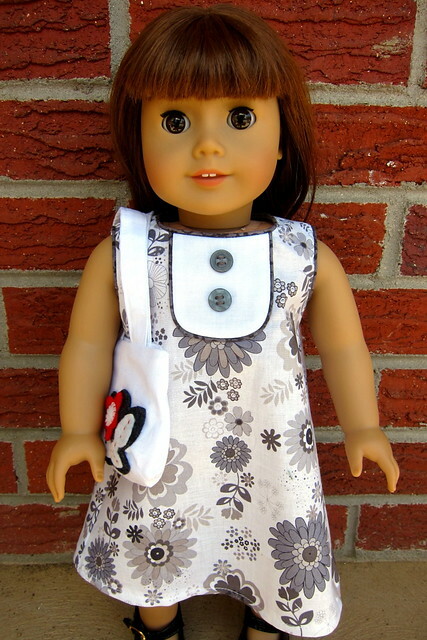 I have gotten more than one email from them saying they can’t afford to buy patterns or new fabric, but are so thankful they can use my free patterns and cut up old clothes to make things for their little girl’s doll. And since I won’t be needing any Regency-era outfits, you can have a chance to win the whole collection of outfits pictured above! **Any purchase you make in my Etsy shop between now and November 10th is your chance to win the whole collection if you put the word “Caroline” in the notes to seller. ** (In case it’s not clear, doll, shoes, and socks are not included ) I will put all of your order numbers into a box and choose one on November 11. If you have made a purchase in the last week or so and want to enter the drawing, just find your order number and send it to me in an email with the word “Caroline” in the subject. Last year, someone (I think it was Barb) asked for Halloween costumes that could be creative, like something other than the standard witch, ghost, etc. Well, it took a year, but I came up with something that can fill a wide variety of costume needs! It can also serve as cozy pajamas, and it’s just adorable when dolls dress up as teddy bears, no matter what time of year it is! I apologize that I did not have time to resize this for Sasha/Kidz n Cats. Enlarging the 13-14″ pattern to 133% should work, although you may need to adjust the length of sleeves and pants. Quarter inch seams are included. You know how I said two new historical collections were coming? 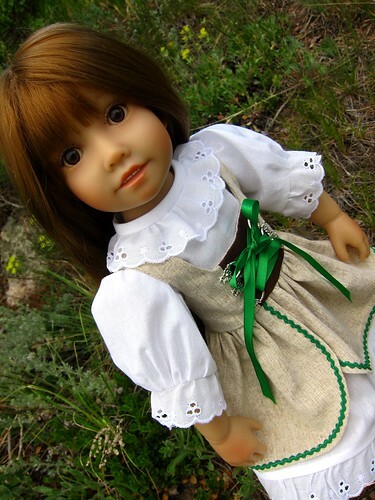 Well, the next one has been delayed a bit, because it’s inspired by Molly, who AG is retiring at the end of this year 😦 and Clementine, the new doll from “A girl for all time,” who is supposed to be from the 1940s. She was supposed to arrive mid-September, then late September, then was supposed to ship this week…well she hasn’t yet, but when she finally does arrive, she’ll have lots of new clothes ready and waiting for her! You can gather the sleeves (or shorten them) and wear over pants or lengthen into a dress. 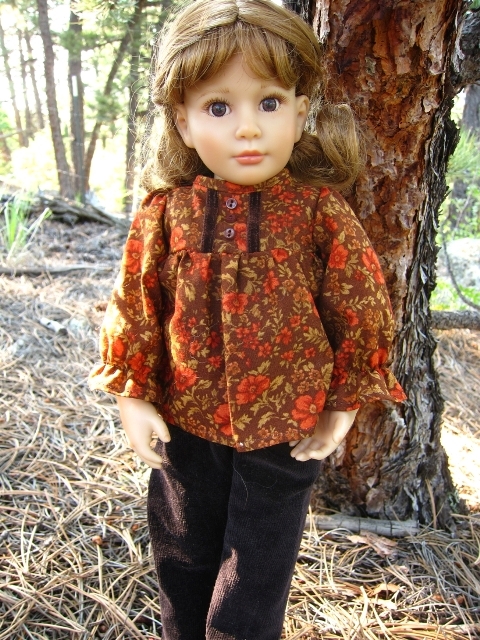 Leave the sleeves ungathered for a more AG “Julie” 70’s look. 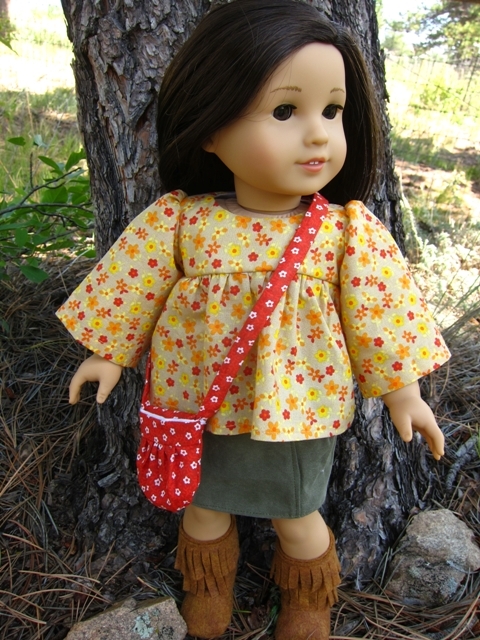 She’s wearing this over the gathered pocket skirt from last week. And in flood updates, I haven’t been more than a mile away from my house in two weeks but they expect to have the main road out of our canyon open by…Thanksgiving. Then again, our gas wasn’t supposed to be turned on for another 2-3 weeks and we just got it back yesterday! Hooray! And not a moment too soon, since the snow line should be dropping to 7500′ tonight. (For you flatlanders, “snowline” means that precipitation falls as snow above that altitude.) For the moment, with the road closures, I have had to take a leave of absence from work. Bad for me, since the best part of my job is working with kids and the yuckiest part is the paperwork/bureaucracy. Now I won’t be able to see the kids or get a paycheck, but I still keep getting emails about paperwork to do. 😛 It’s good for you, though, because I’ll have more time to devote to sewing/blogging. So look for lots of new stuff and probably a coupon for my etsy store next month! Violet’s kawaii smock is a ROUGH pattern I made for personal use (ROUGH = pieces aren’t marked and there are no directions) but I thought I’d post it here. Lots of you have been sewing since before I was born, so I’m sure you can figure it out. 🙂 It would make a great PJ top too in flannel or a lovely dress if lengthened in a dark/print fabric and contrasting white yoke/collar. What’s autumn like where you live? Are you wearing shorts? Raking leaves? If you live in Coal Creek Canyon, your autumn consists of being trapped on a mountain 20 miles from the nearest grocery store with a flooded downstairs, ruined carpet, 50 degree temps and no heat or hot water because the roads look like the pic below! There’s only one road out of the canyon and it looks like this. I actually did this post long before the flood hit us, so the rest of it is happy and doll-related. 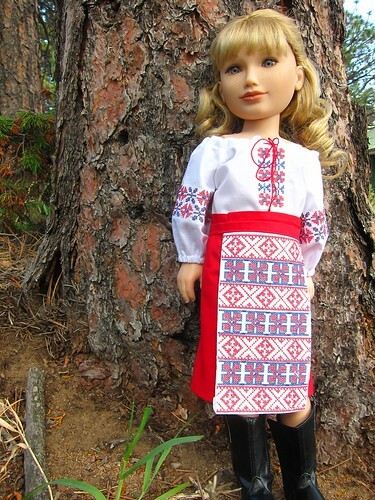 The “official” beginning of fall is this Sunday; is your doll ready for apple picking and drives through the country to see the changing foliage? 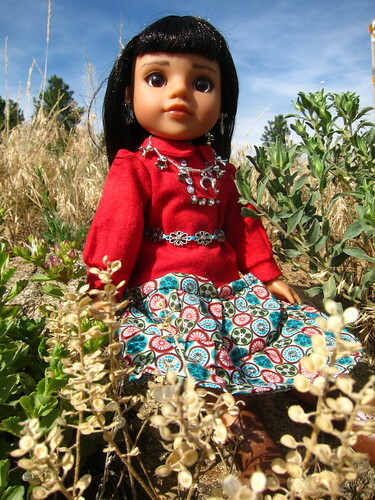 I put together a couple of pieces to add to your doll’s fall wardrobe. This is different from the summer sew-along, where all the pieces were intended to go together and be mix and match. 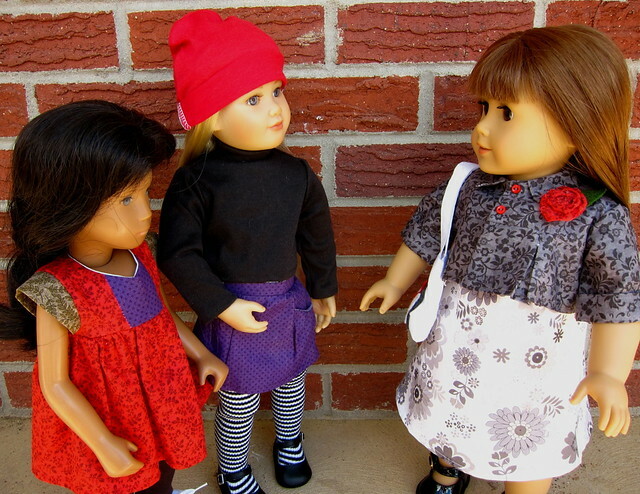 Instead, these are separates to work with things your doll already has. Maybe she can even put them together with things you made in the summer sew-along! The fun and frilly A-line dress from summer turns sophisticated in a neutral palette of colors with piping instead of rickrack to give it a more tailored look. It is topped by a charcoal colored pleated jacket with red accents giving the ensemble a “pop” of color. 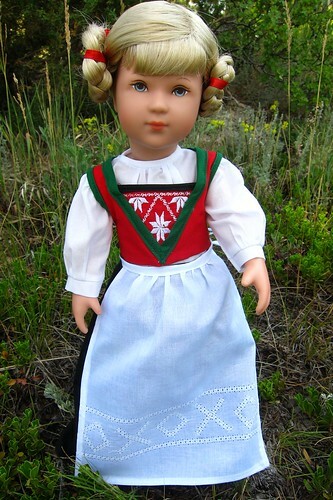 There is a new line of dolls by Käthe Kruse called Marie Kruse Stylista. 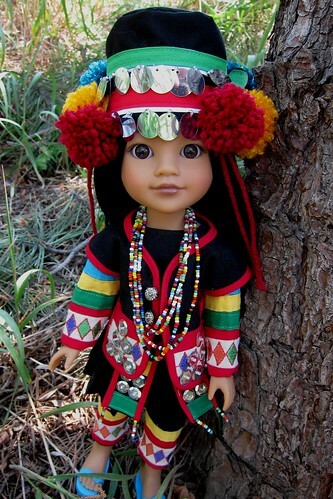 They are basically the standard Toni dolls, with differently painted eyes. They come with two sheets of clothing that kids can cut out and adorn with glitter and rhinestones and rearrange in a variety of ways as well as separate clothing packs for more possibilities. It looks like you will get an entire wardrobe of coordinating clothes. What I actually got was a bodysuit and bag out of blue and green striped fabric, and a long T-shirt dress, pants and a shawl out of rainbow striped fabric. Oh, and a whole bottle of gold glitter glue and a package of red rhinestones. 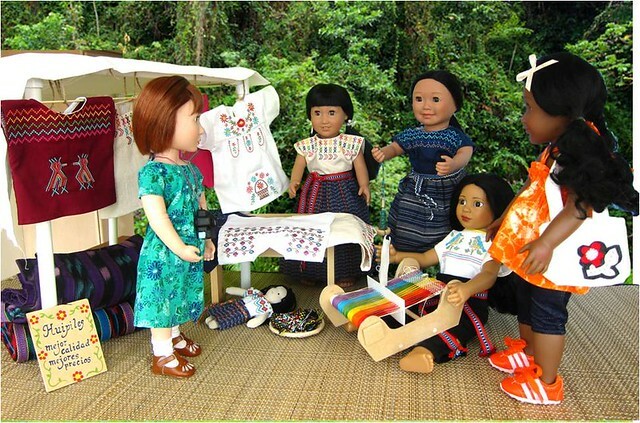 So, not only was I mildly dissatisfied with the doll, I was really dissatisfied with the clothing selection. 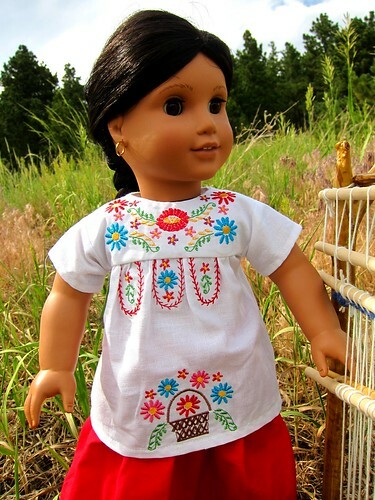 For $100, the doll did not even come with shoes, and had mismatched clothes. 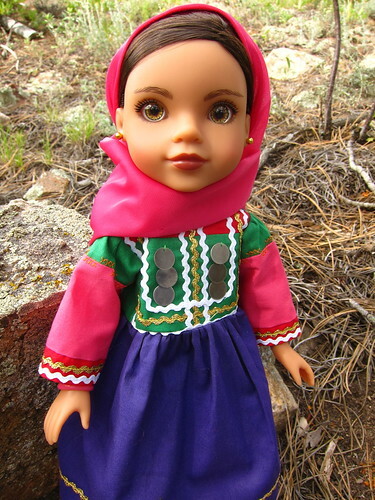 In her defense, you can buy her in Europe for a lot less – I found her on a German toy website for 59 Euros and free shipping, which right now is about $78. 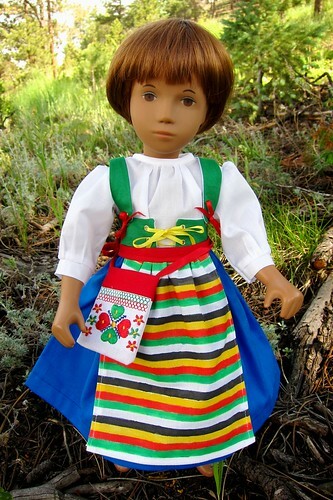 So I sent her back, and ordered a somewhat more expensive Elea Julie doll instead. I’ve been having a lot of regrets, because the concept of the Stylista clothing is pretty darn cool. Not to mention the fact that Julie was HORRIBLY STAINED! I mean, really, who uses magenta thread to serge the inside of a doll garment? That’s just begging for stains. Anyway, after two weeks slathered in zit cream and wrapped in saran wrap she was better, and I replicated a similar wardrobe for my Julie. A lot of the pieces in the MK line are just simple cylinders that can be used in a number of ways, such as arm/leg warmers, or larger ones that could be used maybe as a skirt or a hat or cowl or tube top or…. The original clothing looks like it was sewn on a huge industrial embroidery machine. It comes with the interfacing still attached, with white sewing lines and red cutting lines. The clothing completely lacks any kind of fasteners or finishing, but I think that’s part of the charm. Random bits of scraps can be used as headbands, belts, scarves, etc. I was able to make everything you see pictured in just under an hour! 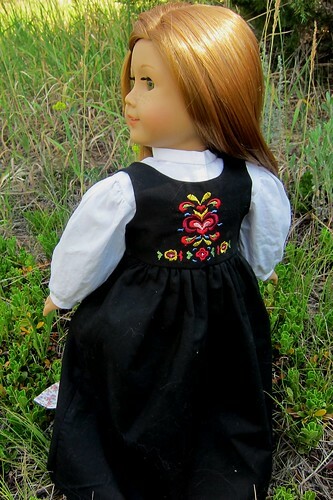 DOWNLOAD IT HERE It will not fit the Marie Kruse dolls, but if you have one and are a seamstress, obviously you can trace that clothes that came with her and sew lots more. I know the AG fans saw and probably wanted this in the latest catalog and then saw it was $90 and thought, “If I only had the patterns I could make it for free!” Stay tuned!